Jain literature comprises Jain Agamas and subsequent commentaries on them by various Jain asectics. Jain literature is primarily divided between Digambara literature and Svetambara literature. 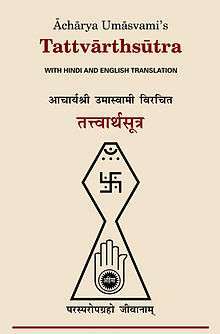 Jains literature exists mainly in Jain Prakrit, Sanskrit, Marathi, Tamil, Rajasthani, Dhundari, Marwari, Hindi, Gujarati, Kannada, Malayalam, Tulu and more recently in English. Acharya Gunadhara wrote the Kasay-pahud on the basis of the fifth Purva‑agama named Jnana‑pravad. Acharya Virasena and his disciple, Jinasena, wrote a commentary text known as Jaya‑dhaval‑tika around 780 AD. Bhadrabahu (c. 300 BCE) is considered by the jains as last sutra-kevali (one who has memorized all the scriptures). He wrote various books known as niyukti, which are commentaries on those scriptures. He also wrote Samhita, a book dealing with legal cases. Umaswati (c. 1st century CE) wrote Tattvarthadhigama-sutra which briefly describes all the basic tennets of Jainism. Siddhasena Divakara (c. 650 CE), a contemporary of Vikramaditya, wrote Nyayavatra a work on pure logic. Haribhadra Suri (c. 1088-1072 CE) wrote Yogasastra, a textbook on yoga and Adhatma Upanishad. His minor work Vitragastuti gives outlines of the Jaina doctrine in form of hymns. This was later detailed by Mallisena (c. 1292 CE) in his work Syadavadamanjari. Devendrasuri wrote Karmagrantha which discuss the theory of Karma in Jainism. Gunaratna (c. 1400 CE) gave a commentary on Haribhadra's work. Dharmasagara (c. 1573) wrote kaupaksakausi-kasahasrakirana (Sun for the owls of the false doctrine). In this work he wrote against the Digambara sect of Jainism. Lokaprakasa of Vinayavijaya and pratimasataka of Yasovijaya were written in c. 17th century CE. 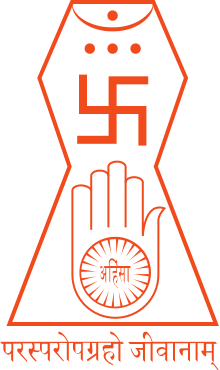 Lokaprakasa deals with all aspects of Jainism. Pratimasataka deals with metaphysics and logic. Yasovijaya defends idol-worshiping in this work. Srivarddhaeva (aka Tumbuluracarya) wrote a Kannada commentary on Tattvarthadigama-sutra. This work has 96000 verses. Jainendra-vyakarana of Acharya Pujyapada and Sakatayana-vyakarana of Sakatayana are the works on grammar written in c. 9th century CE. Siddha-Hem-Shabdanushasana" by Acharya Hemachandra (c. 12th century CE) is considered by F. Kielhorn as the best grammar work of the Indian middle age. Hemacandra's book Kumarapalacaritra is also noteworthy. ↑ Vijay K. Jain 2012, p. xi-xii. ↑ Vijay K. Jain 2012. ↑ Jaini 1927, p. 5. ↑ Jaini 1927, p. 3. ↑ Jaini 1927, p. 2. ↑ von Glasenapp 1999, p. 175. ↑ Banerjee, Satya Ranjan (2005). Prolegomena to Prakritica et Jainica. The Asiatic Society. p. 61.